Do you know about Backpack Buddies??? Backpack Buddies is a program that provides food items to help fill the gap for District families in need. Every Friday throughout the school year, volunteer teams throughout the district converge at the Boys and Girls Club to distribute food donations from the Houston Food Bank. Don, a SHSU Bearkat football player, brings the goods. We caught up with the last week's crew from the Athletic Department at Sam Houston State University when they were delivering food to Samuel Walker Houston Elementary. Soccer teammates Emily and Carlyn get it done. It's a remarkable program in that allows several different groups to join forces to help make a difference to Huntsville kids. It's a big load, but Mason can handle it. The program started here in the District about three years ago at Samuel Walker Houston Elementary school with Covenant Fellowship working with The Boys and Girls Club of Huntsville and the Houston Food Bank. Over the last few years the program has helped countless families and grown throughout the district. Chris Thompson- Associate Athletic Director, Kimberly Spino- Athletic Marketing Dept. 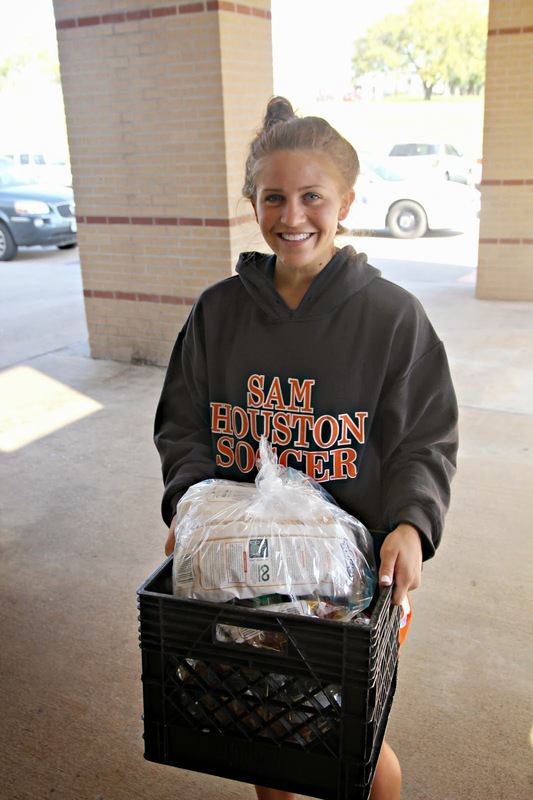 In addition to Samuel Walker Houston Elementary's partnership with the SHSUAthletic Department, Huntsville's Junior Service League works to deliver food to Stewart Elementary, and Huntsville's Second Baptist Church delivers to Scott Johnson Elementary. The program is coming next year to Huntsville Elementary. SHSU Associate Athletic Director Chris Thompson & Samuel Walker Houston Elementary Counselor Judy Phillips. Feed 'em Up Kats! Bye until next Friday!